While mowing the lawn today I found this mutant daisy. 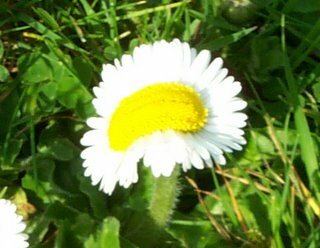 The stem is elongated and not circular like normal daisies, it's like a two flowers fused together, a siamese twin flower. We picked the flower, it's now in a bud vase, and I carried on mowning the lawn. I was at my daughters football match today and I found a mutant daisy. unfortunately it was stood on before I could pick it. My son has come home from school today and as I was locking up the car he asked me what a particular type of flower was "Oh that's just a danelion" I said, "No, not that one, this one" he said "Oh that's just a daisy" I said, "No, not them, this one here" he said. Upon looking at them further I realised that he had found 2 mutant daises in the same clump of grass. Wow, nothing for a year and then two sightings in as many days. I have a twin white coneflower, back to back on one stalk. still looking for info about what to do - but pressing it isn't an option, since it's back to back.